Turn every glass of wine into a treat with your very own personalized painted wine glass! 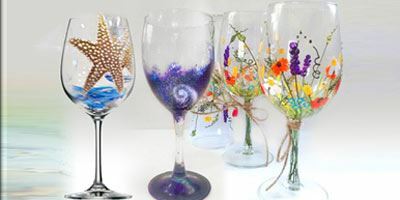 (Or you can paint any glass item that “sparks joy.”) Please bring a wine glass(es), vase, or other glass item to paint. If you don’t have something laying around the house, you can swing by the Dollar Tree or Goodwill and certainly find something perfect. Paint and all other supplies will be provided. Please bring a snack to share of bottle of wine/6 pack to be entered into the second drink raffle for the year. Please contact Lesley with any questions. Copyright © 2019 Newcomers Club of Wheaton, Winfield, and Warrenville.